This is Part II of a multi-part series chronicling my motorcycle adventure from Tokyo to Sapporo and back again. Background: In 2007, I had finally gotten my Japanese driver’s license and a motorcycle. I had been an avid motorcycle rider in Canada before I came to Japan, so after 2 years of no riding, I finally bought a motorcycle and decided to go on a big adventure. I went from Tokyo to Sapporo by motorcycle and ferry. It was an adventure to say the least. On day two, I woke up early and left for Hokkaido. Mutsu was everything I expected, a simple pit stop. There are several routes I could have taken to reach a small fishing village called Oma. I decided to take the main road to be safe as I had to catch my ferry. I stopped at many places along the way and enjoyed this part of my trip a lot. It is the best memories I had. 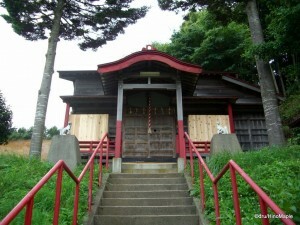 I found a small shrine just outside the city centre. It was built on the side of a hill and very close to the sea. I then took brief stops at various villages along the way for pictures. There was so many things to see and so many interesting and natural things that I took a long time to reach my destination. The villages were technically part of the “city” but they looked independent of each other. There was a nice park and lookout along the way as well. The park looked well maintained, but I was curious as to why it was even there. The lookout allowed me to see some interesting mini islands. They look like rocks sticking out of the sea. If you travel to Matsushima, it’s very similar. The only difference is that there were no holes under the island, but there were lots of tetrapods around. Once I got into Oma, I got lost looking for the peninsula. Trying to understand road signs in Japan is a nightmare. If you ever drive in Japan, you’ll hate them; even Japanese people hate the signs. The peninsula was nice, but very out of the way. It is the northern most point on Japan’s main island, and a mini tourist attraction. The people seemed friendly, but the wind made it cold. 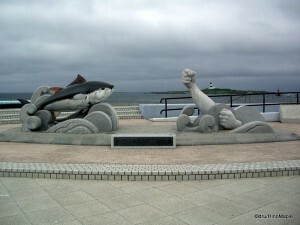 There is a very interesting statue of fists fighting tuna. It’s a symbol of the town, which makes it’s living by catching bluefin tuna. There were a few shops there, but I decided that after taking a few pictures I wanted to head straight to the ferry wharf. Only one question… where was it? The story of this adventure has to be me being lost almost every day that I rode my motorcycle. Once I found it, I relaxed for about an hour and talked to another rider. At the time, I got to practice my really bad Japanese. He was an older guy from the Kansai (Osaka) area and riding an old BMW. Even his bike was older than me. I had a few pictures taken at the wharf and then boarded the ferry. The ferry was a strange design for me. In Vancouver, the ferry is relatively simple to understand. Follow the lanes to your parking space. This ferry was different. It was a medium sized ferry with a special area for motorcycles. Unlike Vancouver, they actually had tie downs for my bike. Once secured, I rushed up to the passenger area. If you have ever taken a ferry from Vancouver to Victoria, I’d consider that luxurious. This ferry wasn’t good at all. There were vending machines selling old looking things and a small kiosk selling your average ferry souvenirs. There is only one place to rest, and that’s the tatami room. It’s a large open room where you can put your things and lie down. While it sounds nice, it’s far from it. The room isn’t that warm and you are given a terrible pillow. It’s basically a black foam block. You do have the ability to watch TV, but unfortunately, reception is horrible. All you can really do is relax and hope the seas are calm. The ferry ride was short, but I got a little sick on the way. 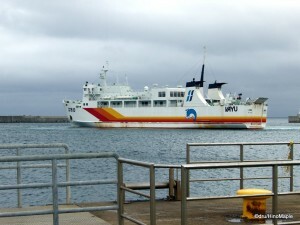 My destination for this ferry ride was Hakodate. This entry was posted in Tohoku and tagged bluefin tuna, BMW, driving in Japan, East Japan Ferry, ferry, fishing village, Hakodate, Hokkaido, Honshu, japan, kansai, maguro, Matsushima, Motorcycle, Mutsu, Oma, Ooma, osaka, park, Peninsula, riding, Shimokita, Shimokita Peninsula, shrine, tetrapod, tuna by Dru. Bookmark the permalink.